Qamishli airport in northeastern Syria – a civilian airport controlled by the Syrian regime that is reportedly used by Russian military aircraft flying missions in support of the regime. At the urging of an American contingent, Syrian Kurds are expanding an airbase on farmland in northeast Syria that could be used for military purposes, according to Kurdish and U.S. officials. Known as Abu Hajar airport, the airbase is located in the Rmelan area of northern Syria, and is controlled by the Kurdish People's Defense Units and the Syrian Democratic Forces. Neither has an air force. A team of Americans pitched the idea to Syrian Democratic Forces to extend the runway, a defense official told VOA on the condition of anonymity. The official Wednesday said the airfield is being extended from 700 meters to 1,300 meters. The extension would be long enough to allow C-130 transport planes to land on the strip and potentially supply those fighting Islamic State forces in the area. “We need runways over there. Our guys said, ‘Hey, it might not be a bad idea to extend this runway,’” the official said. The official added that while Americans did suggest the runway extension, there are no Americans physically helping with the airfield improvement. Talal Silo, a spokesman for the Syria Democratic Forces, told VOA the airbase previously was used to carry agricultural products in the region and is now being expanded for humanitarian and, possibly, military use. Two U.S officials denied any U.S. military involvement in the planning or extending of the airfield, but refused to confirm or deny reports of CIA involvement. "The U.S. military has not taken control of any airfield in Syria and press reports to the contrary are incorrect,” Colonel Pat Ryder, a spokesman for U.S. Central Command, which overseas military operations in Iraq and Syria, told VOA in a statement. “That being said, U.S. forces in Syria are consistently looking for ways to increase efficiency for logistics and personnel recovery support." 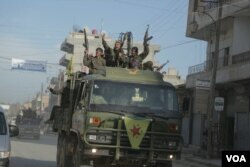 Still, the Kurdish military spokesman Silo said American military experts will soon come to train Kurdish forces. “These experts will need a lot of equipment that can be sent via planes,” he said. Imagery and eyewitness accounts in Syria and Iraq have appeared to support increased involvement by the United States. According to the global intelligence company Stratfor, low-resolution satellite imagery, taken December 28 and released last month, showed construction to extend the runway. A VOA reporter who visited the airbase over the weekend found that it is heavily protected by walls and forces belonging to Kurdish Protection Units and Syrian Democratic Forces. No journalists are allowed to enter the area. The airfield is 120 kilometers from the Qamishli airport – a civilian airport controlled by the Syrian government that is reported being used by Russian military aircraft flying missions in support of the regime. There was no evidence of a Russian military presence at Qamishli airport when VOA visited, but Fesla Yusif, deputy leader of the National Council of Syrian Kurds, confirmed the presence of Russian forces there. Yusif said he is troubled by what appears to be an increasing U.S. and Russian footprint in northern Syria, which largely has been free of fighting or an IS presence during Syria's civil war. “Syria is in a very bad and uncertain situation,” Yusif said. “International powers have increased their presence in the country without a clear strategy." VOA’s Rikar Hussein contributed to this report.